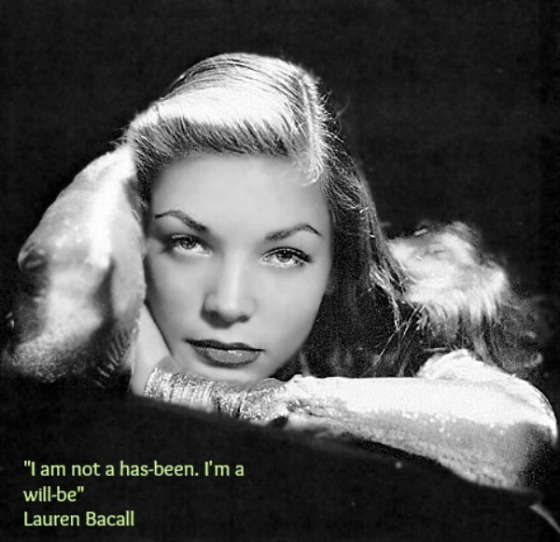 I’ve loved this quote from Lauren Bacall since I first stumbled on it. I had no idea it would feature so much in my life though, when in my late 40s I gave up my comfortable secure job and pension to launch my own business. At 58 I’m still a ‘will be’. Thanks, Lauren! RenewYou is the life changing course I wrote and now licence to experienced & excellent trainers across the world. Photo Credit: I’m unable to attribute this photo which I believe is a still from a film. Please let me know, if you know. Couldn’t agree more….confidence has a bit part to play in this. A great sentiment, I think we sometimes forget what these ‘Hollywood’ women achieved and had to fight for.